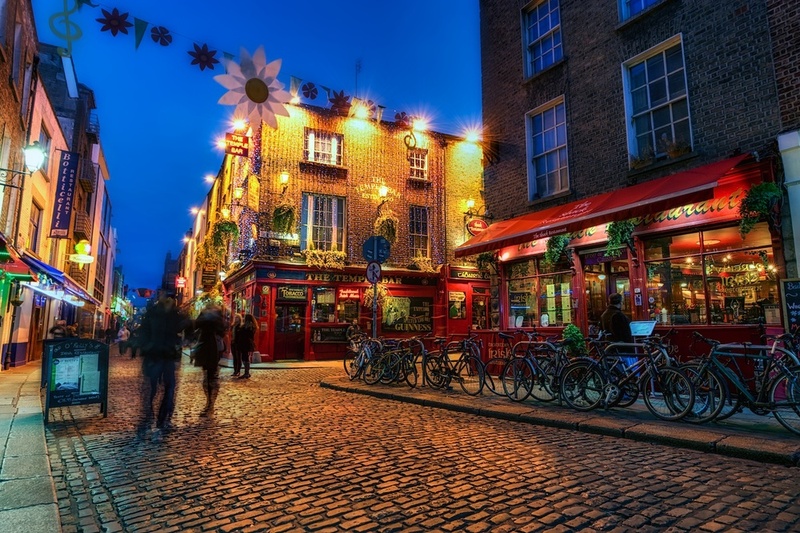 The Temple Bar in Dublin - beautiful at night! I love Dublin, and I say that a lot here. There's a lot to love about that town. One particular spot that I love there, probably more than all the rest, is the Temple Bar District, and the Temple Bar pub itself. The area is basically their nightlife and entertainment district, and it centers on The Temple Bar pub itself, which you see in the photo. The district has retained it's historic, sort of medieval feel and the streets are all cobblestone, which adds to the cultural feeling of the place. Of course that makes walking a little harder, especially when I am carrying a large camera on a tripod and looking around, not down at what I am stepping on. I haven't fallen over yet, but have come close a few times! And yes this area is a magnet for tourists, but I don't care - I just love it. It has so much character. And in case you are wondering, yes this is an HDR photo. I actually don't shoot too much after dark, but I was headed back to my hotel on the evening I took this one, and just couldn't resist a few more shots. Of course, I do that a lot!